We just saw Sony tease a July 4th unveiling of what looks much like its upcoming Xperia Z Ultra aka Xperia ZU or the Togari phone, and now we have a leaked image of the upcoming device in all of its phablet glory. The Sony Xperia ZU is expected to be a gigantic device coming closer to the sizes of a small tablet rather than a big phone. With a 6.44” display isn’t this just way too big? Or is it just the right size for media consumption. There are always two points of view, but we’re curious to hear your thoughts about this. Wow nice! The Dark Knight (Sony) is rising! Dude that snapshot of xperia z, not this zu. and for picture of this phone, Yea this is not fitting my pocket. I guess fashion need to change back to baggy jeans to fit these phablets. What's your problem? I posted the screenshot for Sony fans, the 4.2.2 is coming! It's not for you! If you didn't want this kind of phone then don't buy it, it's simple as that! find some ice dude. why are you burning up? just pointing out what you forgot to mention. and i like this ZU but throwing out my comment about its size, if you dont like it ignore it. Holy sh!t that thing looks huge. Snapdragon 800? Already available by now? 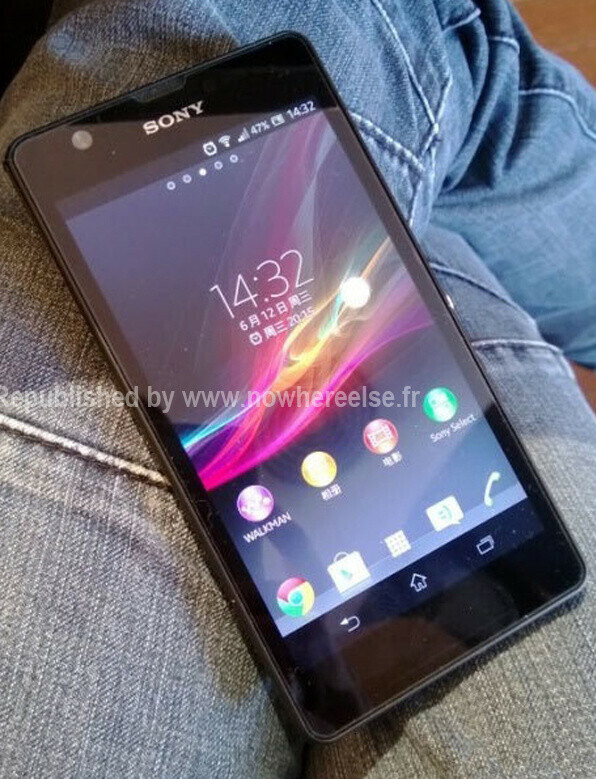 Brace yourselves Samsung fanboys, the Holy Moly Sony Xperia ZU is coming! This image confirms this phone has the same terrible TFT screen which produces very bad blacks and poor viewing angles. Not to mention arguably thick bezels (sides and top/bottom both). Also, consumers would need to again wait another 6 months for an update in future (that too on a flagship!). I hope they atleast get the camera right this time ! If so, then there is something for Samsung fanboys to worry about ! P.S. : Nice job starting the fanboy wars for no reason ! Unfortunately, that is true. I like what sony is doing with their new phones, except the screen. This looks like ZR on the lap of 8-year old much more Compare if you don't believe me. Not 8 year old, but Asians, and the Japanese are more petite than Koreans. At least many of them look younger than their actual age, which is what i like about them. A japanese male and female's average height is only 1.7m and 1.5m respectively. And with 6.44" screen and that big bezels this is more like tablet not phablet. P.S XperiaDROID Must love Samsung! I have and it made me very excited when I first read it would feature in the new devices this year. But were you actually bothered to see the picture before posting your comment ? Does that picture look like a triluminous display ? That is the same awful display which they've used in Xperia Z ! lol.why only sammy fanboys huh? Below, he says, Don't feed the troll," yet, he's one of the biggest trolls here. Thank you, I will take that as a compliment. Because Sammy fanboys think that the Note 3 will beat all the phablets from other manufacturers. I don't see any new phablet.Sony with 6.44" is more like Galaxy Mega. i think any portable device with native calling feature is a phablet no matter how big the device maybe thats why Asus call their 7'' device Asus "Fonepad"